Bill Clinton accepts Israel’s Presidential Medal of Distinction: The former president discusses the genocide in Rwanda as his greatest regret. In Israel, Bill Clinton turns wistful talking about his greatest regrets and his hopes for the future. 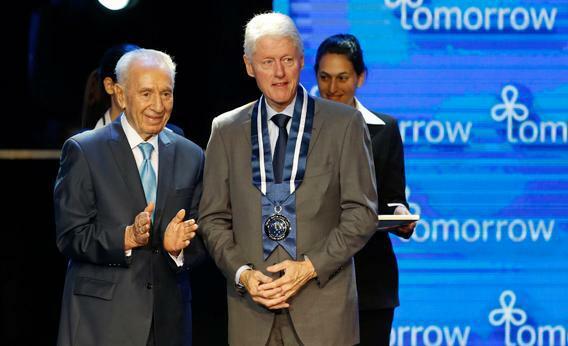 Israel’s President Shimon Peres (L) stands with former U.S. President Bill Clinton after awarding him the Presidential Medal of Distinction at the fifth annual Presidential Conference in Jerusalem June 19, 2013. It was a morning of strange moments, featuring former leaders who were free to speak openly in ways they once couldn’t. From Tony Blair’s flawless Hebrew “todah rabbah” (thank you) or Rahm Emanuel’s pitch for Chicago that even had Blair wondering out loud whether he could relocate there, the sensibility was nostalgic and oddly reflective. * But it was Clinton’s reflections on the meaning of “tomorrow” that seemed more Hamlet than Annie. “I’m just asking you to think about that,” he said, the way he might suggest buying a Prius, or pomegranate juice. Maybe Clinton was feeling wistful because he was being feted for what he had tried but ultimately failed to accomplish in the region. Maybe he was feeling melancholy because most of his partners in that effort are either dead or very late in life. (Shimon Peres is celebrating his 90th birthday this week with much De Niro, Streisand, and Sharon Stone.) Or maybe this is a new iteration of Clinton, as John Harris and Maggie Haberman noted in Politico this week: an “autumnal” Clinton seeking to translate political goals into personal, even spiritual themes. Musing on his own imperfections, his own struggles with despair, Clinton was less charming than I have seen him—no Slick Willy here—but strangely more urgent. The ovation was deafening. Maybe it’s just the place, or maybe it’s the time in his life, but Clinton had somehow channeled the tetchy old prophets of the Old Testament: Change your heart, repent, try harder, let go. Less geopolitics, more church basement.